BEND, OR -- After several years of local debate, a small section of Central Oregon Canal is now listed in the National Register of Historic Places. 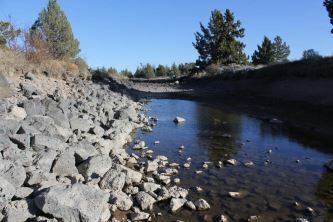 The Central Oregon Canal, along with the Pilot Butte Canal, forms the backbone of the project that provided irrigation to tens of thousands of acres of land; its construction began in 1904. The Central Oregon Canal Historic District comprises 3.4 miles of the 47-mile long canal, bordered by Ward and Gosney Roads in Bend. Oregon's State Advisory Committee on Historic Preservation recommended forwarding the historic district's nomination to the National Park Service in November. The National Park Service, which maintains the National Register, accepted the nomination and listed the Central Oregon Canal Historic District in the National Register on March 18. The listing was just announced Tuesday. A stretch of Pilot Butte Canal was added to the National Register in August 2017. And, another section of the Pilot Butte Canal on the north end of Bend was included on the Register in February 2016.